Trayvon Martin "riots": Who's exaggerating this time? Who’s Disappointed About the Lack of Mass Zimmerman Verdict Riots? Via Alex Koppelman, we see that the Drudge Report’s banner of links creates the impression of America “gripped” by “fury.” The careful reader will notice that the photo doesn’t seem to reveal any burning buildings or cops buckling under a hail of rocks and bottles. 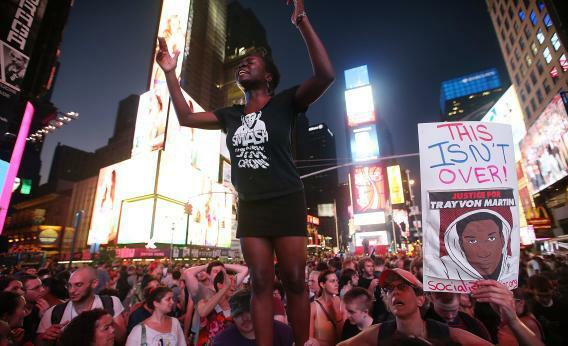 Demonstrations, from Florida where the trial took place to Atlanta, DC and New York, remained largely peaceful, though Los Angeles protesters managed to shut down an entire freeway and thousands of New Yorkers mobbed Times Square and blocked traffic for an hour. But “shutting down a freeway” by walking into it was not the wave of riots speculated about on Drudge’s site and elsewhere. If you only got your news from that site and its links, you’d think that race riots were breaking out with regularity, and the media was ignoring them because the perps were black. (As McKay Coppins reported at the time, the “why aren’t you covering this” coverage surged in the wake of Trayvon Martin stories.) Did police scramble in the wake of the verdict to prevent anything from going sour in the cities? Yes. It just seems noteworthy that very little went sour. “Urban blacks may riot when X goes wrong for them” is a perennial story, one that got written in the run-ups to elections in 2008 (“Police fear riots if Barack Obama loses US election”) and 2012 (“New threats to riot if Obama loses the election”). An act of civil disobedience that blocks traffic—on a Sunday, not even rush hour!—isn’t an act of fury that tears a country apart. Honestly, don’t the panic-mongers remember what it felt like when peaceful Tea Partiers were accused of incipient anti-government violence?